Syncrify includes a built-in troubleshooting mechanism that can detect common problems users run into. 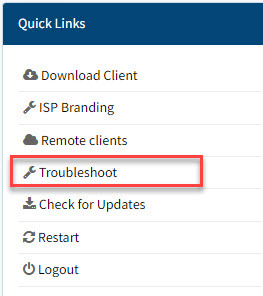 Click the troubleshoot link under Quick Links to start the troubleshooting process. Syncrify running on your end will communicate with Synametric's web and email server to perform tests. This is required to run additional tests. If this test fails, connection tests cannot be performed. Inbound connection tests are performed from the Internet. This test is performed against the two HTTP and one HTTPS ports. Results of this test are irrelevant if you are using Syncrify in a closed environment where Internet is not available. Two test emails are sent to the SMTP server. First to the admin and second to tsTester@synametrics.com. The later email address is an unmonitored address on our server. This test ensures you can send emails to users on the Internet containing backup reports.